Bowflex TreadClimber TC20 Review – Is the Upgrade Worth the Price? 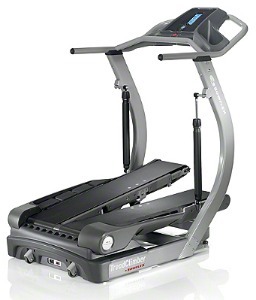 The Bowflex TreadClimber TC20 is an update of an older model that adds longer foot treadles among other things. The backlit LCD display shows five readouts for Speed, Distance, Time, Calories and Heart Rate. The interactive G.O. Coach™ Console lets users monitor their own fitness program, as well as input daily workout goals and record progress over time. UPDATE: The TC20 is no longer available. It has been replaced with two new Bowflex Treadclimbers, the TC100 and the TC200. The latter is comparable to the TC20, as it shares many of the same features. However, it's actually a few hundred dollars cheaper, about 10 pounds lighter and adds Bluetooth workout tracking capability that the TC20 did not have. The TC200 also has a tablet rack and a more advanced display, so it's really an all around improvement for the TreadClimber. Take a look at the TC200 to see if it has what you are looking for. You can also save about a $1000 and go for the base TC100 instead. The Bowflex TreadClimber TC20 offers three workouts in one machine: as a treadmill (simply connect the two belts for a wider walking platform), as a stairclimber (the two dual treadles lets you step up), and as an elliptical (a combination of the two other motions). But that kind of variation is also the problem with the machine – it is highly complex and doesn’t have the long range reliability and duration for average home workouts. Pay attention to customer reviews and don’t ignore the comments made by unhappy customers. They are trying to pass on their bad experiences to save you money and hours of frustration. According to reports, these models have had numerous problems with the motors and hydraulics, as well as being uncomfortable to use. You are better off buying an elliptical if you want a cross between a stairstepper and an elliptical oval, and remember, the top speed here is only 4.5 mph with very short dual tread belts so keep in mind that you can’t run on this modified treadmill. While it offers a nice (and totally unique) workout, it isn’t worth $3,299 to buy yourself a potential headache. Because the complexity of the dual tread belts and the hydraulics, the Bowflex TreadClimber TC20 will break down at some point in the future and will have to be repaired. For this kind of money, you can buy a really outstanding traditional treadmill with a 15% incline that you can even run on. You can’t go faster than 4.5mph on a TreadClimber. If you like the motion of the independent treadles, perhaps you might be happier with an elliptical trainer. Editor's Note: The newer TC200 is worth considering, although it has the same drawbacks as the TC20.